Product prices and availability are accurate as of 2019-04-21 07:40:39 EDT and are subject to change. Any price and availability information displayed on http://www.amazon.com/ at the time of purchase will apply to the purchase of this product. Amazon.com Product Description The MFC-8860DN has a convenient flatbed design that accommodates either single sheets or bound documents for copying, faxing, or scanning. With the ability to function as a digital copier, the unit supports reduction and enlargement of documents from 25 to 400 percent in one percent increments, makes up to 99 copies, and includes sorting functionality. Copies up to legal size can be made from both the glass and the automatic document feeder. Print and copy speeds up to 21 pages per minute keep up with busy offices, while outstanding resolution of up to 1,200 x 1,200 dpi gives each document exceptional legibility. 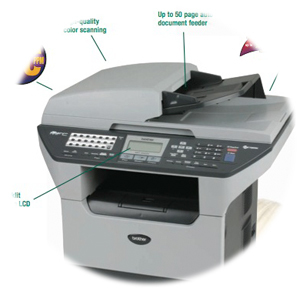 The MFC-8860DN features two sided (duplexed) printing, copying, scanning, and faxing. You can take a typical document file and simply choose to print it as a duplexed document right from the MFC-8860DN's print menu, with the orientation you prefer. Your selection then happens automatically, without the need to reload the paper to print the other side. You can also copy or scan two sides of the same document and either print the copy or store the scan as two single-sided pages, or as a single two-sided page. Or, you can copy or scan two single-sided documents and produce a copy or store a scan as a single two-sided page. You can even scan a two-sided document for faxing with only one step and it will be received as two single-sided pages. Print, fax, scan, and copy -- all from one powerful unit. View larger. Send scans, copies, and faxes directly from the MFC-8860DN to colleagues that are listed in your network address book. Choose the document feeder or the flatbed. Single or double sided -- you make the call. As a full-function stand-alone fax machine, the MFC-8860DN supports up to 340 total speed dial locations, and also incorporates dual access and broadcast faxing features. It stores up to 600 pages for Quick Scan faxing or out-of-paper fax reception. Stand-alone fax and copy operation is standard, so no computer is required. When operating as a scanner, the unit is capable of color scanning up to 9,600 dpi interpolated resolution (up to 600 x 2,400 dpi optical). For Windows and OS X 10.2.4 or greater based users, there is an easy-to-use "scan to" button for scanning directly to an FTP site, image application, OCR, E-mail application or file. Save time and reduce errors with instant direct access through your network connected MFC-8860DN to a virtually infinite number of e-mail and fax addresses stored in your LDAP network address books. Simply use the large, clear 5-line LCD display on the MFC-8860DN's control panel to view the contacts stored in your network address books and scroll to select the address you need. 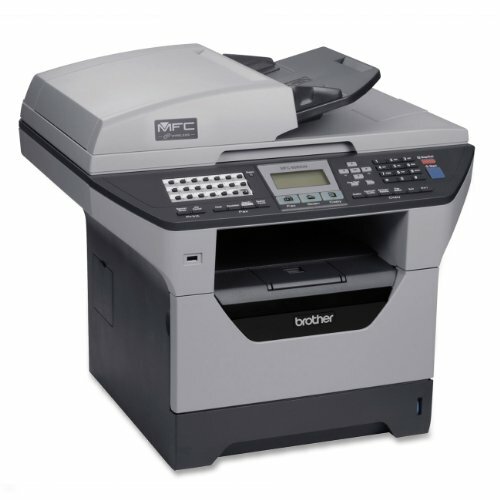 Then you can quickly send faxes and Internet faxes to your selection, and perform scan-to-e-mail-address functions. The MFC-8860DN provides the ability for an administrator to set various levels of password protected access to certain features, for each of up to 25 different users per machine. Through this feature, you can restrict specific employees such as part-time workers or interns from access to scan-to-e-mail functions or other avenues for sending data outside your walls. The color scanner function comes bundled with document management and OCR software. ScanSoft PaperPort SE with OCR software is available for Windows and Presto! Page Manager is available for Mac users. Meanwhile, The MFC-8860DN is supplied with built-in wired Ethernet networking. The unit is compatible with both PC and Mac operating systems (Windows 98/NT4.0/2000/Me/2000/XP and Mac OS 9.1-9.2, OS X 10.2.4 or greater). Standard emulations of PCL6 and BR-Script3 (PostScript3) are included as well. Brother provides a one-year warranty, covering parts and service.